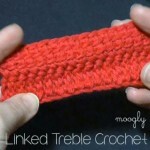 In US crochet terms it’s called the treble crochet or triple crochet stitch, abbreviated trc, or just tr. In the UK it’s called the double treble, abbreviated dtr or dbl tr. 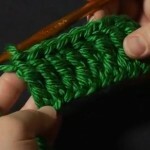 No matter what you call it, it’s a natural progression from the double crochet stitch. In other words, to make a treble crochet stitch, wrap the yarn around the hook twice before inserting it in the next stitch. 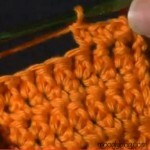 Then, insert the hook in the stitch, yarn over and pull up a loop through the stitch. At this point there are 4 loops/wraps on the hook.Yarn over and pull through 2 loops (3 loops remaining on hook), yarn over and pull through another 2 loops (2 loops remaining), and yarn over and pull through the last 2 loops on hook (1 working loop left on hook). An easy way to remember how to make a treble or triple crochet is to think that you start the stitch with 3 loops or wraps on the hook and then pull through 2 loops 3 times. Treble = triple = three! If you are making rows of treble crochet, you will likely either start with a ch 4 which will count as your first stitch, or with a ch 3, which will not probably count as a stitch – but there are always exceptions, so read your patterns carefully. You will see trc a lot in afghan square patterns, where it often helps square up the corners of patterns that started off round, and in cable crochet, where it’s length is used to create waves and lines that dance across the fabric. Patterns here at moogly that use the trc include the Diamond Crochet Cowl and Riley Flower Square Motif, as well as the Cable Heart Gift Bag. 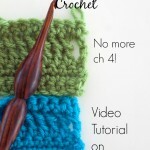 I hope this video has helped you understand this stitch a bit better! It takes some practice to keep it even, but it’s a great stitch to know and very handy indeed. Are there any stitches that are giving you trouble, or that you’d like to see in a moogly video? Let me know in the comments! ran across the instruction “sept.tr” I don’t know what “sept.” means in this context. Please help? Thank you for this. I’ve been crocheting for a long time and for some reason, this stitch is always difficult for me to remember. I don’t use it as much as other so I always have to refresh my memory. Exactly how do you TR2tog? Love the look of the dishcloth but can’t figure the TR2Tog so I am stuck. I found a pattern that has a triple popcorn stitch. Do I make 4 trpcr and leave the loop on the hook before dropping it and inserting into the ch4 or top of the first treble stitch? Hi Jennifer! Special stitches *should* be defined in the pattern, but it sounds like this one isn’t. For a popcorn, you would (generally) remove the hook from the loop, insert it into the top of the first st (or turning chain, if that’s part of the stitch – if you’re starting with a ch-4, then that’s likely where you put the hook), then put that active loop back on the hook, then finish the stitch.